The Perfect English Weather are Simon and Wendy Pickles, a duo from Brighton taking time out from The Popguns to create an enchanting collection of odes to overcast afternoons in seaside cafes, conversations with cats, and weekend adventures to cancelled Morrissey concerts. Inspired by the unjaded love of a great pop song, the result is grown up music for those who still prefer a karaoke party to a dinner party. Their debut album, ‘Isobar Blues’, was originally intended to be a short set of simple acoustic recordings, but as so often it does, one thing lead to another and they couldn’t help turning some of these vignettes into full-on electric guitar pop. 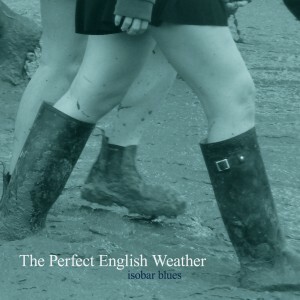 The result is a flurry of guitars, words and melodies that stay with you all day … as their signature song ‘English Weather’ so dreamily reminds us. Mixing a little heartache with healthy dose of humour, this is an album for daydreamers to get lost inside, painting hazy glimpses of everyday life, always with half an eye on the skies and those prevailing south westerlies. Bang out of the blocks opener, ‘The Sweetest Feeling’, has an almost Motown feel to it and a great positive vibe backed by a joyous chorus. ‘Hit Town’ is a very tongue-in-cheek Smiths styled jangler, telling the story of a weekend in Athens where Morrissey cancelled his concert last minute as he couldn’t “make his plane in time”. The perfect, cool laid back groove of ‘Try A Little Harder’ is again less than serious as listeners are reminded not to be too tough on each other’s little imperfections. ‘Reacquainted’ begins with a slow picked guitar and plaintive vocals before opening into its full glory as our clandestine couple emerge into daylight from a cinema matinée. ‘English Weather’ is the first of the fully acoustic songs and is a perfect chance to close the eyes and get lost as Wendy’s gorgeous tones describe a rainy afternoon spent hidden away in a park café. We are then kicked back into life by ‘Spirited Away’, a perfect pop tune with a wicked hook that seems to refer to the death of a favourite pop star – do we wonder who that might be? ‘London In Your Eyes’ changes the mood and is a straight slice of heartache with definite echoes of Lou Reed and Galaxy 500 in an arrangement which features Wendy on organ … and tambourine of course. From this point the album meanders downstream in a more low-key, acoustic vein. ‘Christmas Single’ is a lovely old song about spending Christmas at home with the family with someone else on your mind, while ‘You Wrote’ is a simple acoustic arrangement with to-die-for vocals and a rare appearance of Mr. P on harmony backing vocals. The album closes with ‘Two Stars’, which has a stark, ethereal feel and a lyric loaded with cosmic metaphors, leaving a final image of our tiny place in time and space - a beautiful way to end the record.